W.H. Auden established his literary reputation in a decade framed by economic depression and global war. He emerged as the defining literary voice of the 1930s while the doumentary genre emerged as the decade's principal discourse of social reality. In ""Auden and Documentary in the 1930s"", Marsha Bryant examines this cultural convergence to challenge standard assumptions about socially engaged art. Restoring to Auden's canon the commentaries he wrote for documentary films and the photographs he published in his documentary travelogues, she considers the decade's interplay of visual and literary texts. Auden's first-hand experience with the British documentary film movement, along with his position as a gay man, prompted him to interrogate the politics of documentary representation. His work with the GPO Film Unit reveals ways in which the act of men filming men can blur boundaries of class and homerotic voyeurism. In ""Letters from Iceland"" Auden juxtaposes poetry, prose and photographs, using modernist collage to question documentary ideas of order. The famous poem ""Spain"" challenges the artist's role as observer by rejecting journalistic techniques such as interviews and reportage and obscuring distinctions between civilian and soldier, reader and text. 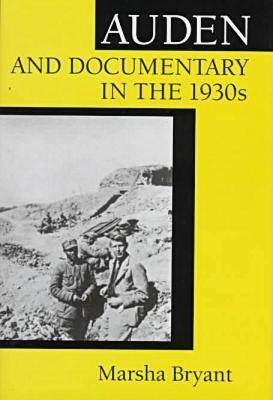 In ""Journey to a War"", another collaboration between photographs and words, Auden and Christopher Isherwood use their position as gay Englishmen in China to expose the heterosexism and imperialism inherent in traditional British documentary discourse. The 1930s continue to provide our dominant models of socially engaged art, especially through the documentary genre. In Auden's alternative documentary texts, Bryant reveals, the 1930s can also suggest new models of representation. This multilayered study should appeal to scholars of film studies, modernism, cultural studies and gay studies, as well as to Auden's legions of fans.